Ever notice how long a week is before a holiday? I'd swear longing for the extra day off makes the 5 days go by even longer. I also believe it seems longer as most people do the work in advance of the day off, too. This week has been a hard one for me. I have had to adjust to taking a college course again. My class is 6:00 – 8:40 MW. Our first class was the 25th and it went quite well. I believe there were 15 of us and by the end of Wednesday, there were only 9... they're dropping like flies. (Thank God for audits, in my case). Because the course is really hard-core, you have to be "on". We barely tipped our toes the first day, but dove it fast on the second. I'm pretty tech-savy, but this software is really intense with a strong learning curve - even for me. It is hard to be a good employee and then a good student. I know I'm the only student in the class not going for credit, so I will try to take a back seat to everyone else. My reasons are very specific and are for my career goals, aka, be marketable. So, yes, I'm in there for selfish reasons, but I'm not trying to take over any of the time for the "real" students. Hard to find the middle ground. My home arrival averaged 9:10 those nights. I'm dead by the time I get home, drop all my gear, say hello to M and get ready for the next day. I admit, Tuesdays and Thursdays are VERY nice now, as they are my time. That means I can do what I want, when I want. So this week, I've been looking forward to the long weekend and the last days at the pool. Next week will be a short week, but I know it will feel even longer. Tonight is my first day back in school in quite a while. I've had classes here and then - a full day here, 4 nights in a row - 3 hours at a time. But nothing like this. Hopefully, it'll be a nice class and I get my $'s worth. I did the easy math: 31 days for $290 total. Less than $10 a day. That's about $3 an hour. Well worth my time (I hope). I 'm not exactly excited to be gone 2 days a night from 6:00 – 8:40. I just hope I can get out of the class what I need. I hope there aren't any annoying kids, know-it-alls, loud gum chewers or heavy breathers. They can ruin it for me. We'll see... off to school. I just posted on my community's blog the pool hours for the remainder of the season. As most of you know, I'm a pool junkie. Cleveland has 3 months of nice weather, and I make the most of it. It'll be 10 degrees out before we blink. Some people think I'm selfish because I won't make other plans on the weekends. I don't do yard work or house work on the weekends – that stuff can be done any week night after work. The weekends are my time. I work hard all week, and I want to enjoy my 2 days off... at least from 11:00 a.m. to 4:00. I can't remember a time I didn't have a pool to use for summer. We always belonged to a Country Club or had one in our subdivision. I was a real pool kid – lived there in June, July and August. I ruled the pool. It was MY pool. And I was a great swimmer as a kid (I still am). I actually swam as a teenager – and didn't care about boys or my tan. By the way, I was getting a better tan IN the pool, and swimming WITH the boys. So, naturally it was a must for M's and my house that it had a pool. Our first summer on Memorial Day weekend, I went early to my pool. (notice I said MY pool - as I rule this one too :) There are 25 lounge chairs for 222 homes. Do the math and you'll know why I showed up early. This comic says it all (click to view larger). Today is an anniversary for me (sort of). August 19th, 1985 was my first day of college.I have strong memories of that day. It was really , really hot. Typical middle Tennessee in August. It was really, really busy. Typical move-in day at the dorm. It was really, really scary. Typical Freshman. I only looked at a couple of schools – I decided on one that seemed safe to me. I had been on my campus the year before for cheerleading camp (don't judge me). It was the obvious liberal, state school for me. But my Dad was transferred to Connecticut the summer I graduated high school. I moved with my parents and younger brother (me being only 18 and still under Mom & Dad's wings). I stayed in Connecticut for about a month and the four of us then headed for my trip to college... in Tennessee. Yes, I know it sounds stupid that I went to a state school in Tennessee while living in Connecticut. But as long as I was accepted as in state, my status stayed with continuous semesters. Don't forget that Mom & Dad paid for my school. So beggars can't be too choosy. My older brother was already in Tennesse, entering his third year in college in Tenn. And we moved often, so this decision didn't seem out of the ordinary to us. The day I was dropped off at school was really hard for all of us. Our van broke down right in front of the dorm. Not a good day. It was already an emotional day for us, but it put more pressure on the day. I think my Mom and my younger brother were OK, but my Dad took it hard. It was merely 2 years before when he dropped off my older brother – but with big differences. A. He's a boy B. He's first born "it's good for him" C. He was only 2 hours away. Enter my issues – A. I'm a girl. B. I'm the only girl. C. I'm always 2 years younger than my brother D. I am about 1,000 miles away from home. That night, I went to an orientation game thingy for Freshman. It was really lame. I walked way across campus to a convenience store and bought food for my dorm room fridge. I didn't think as I bought a gallon of orange juice an a 1/2 gallon of milk and had to carry it about a mile. Plus, I wore white loafers. (again - don't judge me). I cried on my way home, and even then I don't know why. I guess I was just feeling sorry for myself. It was the first time for me on my own. And that is scary when you're 18. I knew my parents weren't going to be just a two hour car ride away, and that I would see them next at Christmas break. I'm tough, but I'm still a softie. So, 23 years later, I'm back in college. I'm enrolled in an animation class. It is a necessary evil class – as I'll be in class 6 – 8:40 MW until mid December. Talk about cramping your style. Now that I've been out of school, 1 lone class seems like a huge burden on my life. But in order to get ahead, I have to have this class. Once I learn it, no one can take that away from me. And if I chose to use it for work or to help me find another job, that is OK, too. It is good to be back in college. I'm a dog person, but I have no dog. And I'm not just a dog person - I'm a lab person. And I don't have a labrador, either. What I do have is 3 cats. I put my black lab, Alex down 12 years ago, April 2. Yeah, I remember the date. It seems like yesterday and so long ago, too. I've talked about Alex before here, as he was a major part of my life for 12 years. He was my real friend. I have a term for certain kinds of dogs like Alex: bubbadogs. I used to call Alex "Bubba" in private. It was my word for baby and friend – and he was both to me. Now, when I see a retriever, I think to myself - "what a nice bubbadog". M knows I do this, but not many others. There are few other breeds that are bubbadogs – my in-law's dog, Graham was a bubbadog, too. I have also defined my cat Jake (Jacob T. Marlie – T. stands for TROUBLE) as a bubbacat. This, of course, is because Jake has no idea he is a cat. (We haven't told him yet). My brother has a new bubbadog (see post below) and I'm kinda jealous. The thing is, I can't have one – yet. M and I thought of getting a lab 2 years ago when Flynn died. Instead, Jake became our new, feline friend. I just wasn't ready to commit to a dog then. I guess I was also having issues with "replacing" Alex, too. I've missed Alex for years and I have a hard time thinking of someone else in his place. With my brother's new dog, the idea has entered my mind again. But our cat, Rumba (see former post) would not approve. She's not doing well, and she's showing her age lately. She simply would not take to a dog and she would be miserable. She barely can stand Jake and Flip, let alone a puppy. It is not fair to her in her senior years. In the past 3 days, I have been sent 3 "free to good home" emails. The first 2 were for cats and today for LAB PUPPIES. I have a hard time forwarding the cats to friends who may know someone who needs a cat. 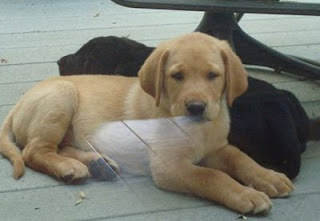 But the one today was hard - and besides, who gives away lab pups? Geez. As for M and I – we will eventually have our very own bubbadog, but not yet. I have injured my foot, ankles, knee and now I have a bad right hip. You'd think I was an athlete or 70 years old by the first sentence, but I am not either. My ankle injuries are due to me being a clutz. The knee is an injury from High School and loads of visits to the orthopedic surgeon. My right foot is a real treat to look at. I have a 5" scar on the top from surgery in High School (again). I was on crutches for almost half my High School days due to my knee and foot. My foot injury was a mixture many things. Bad genes (sorry, Mom & Dad). A car seat slammed was slammed on the foot at Lambeau field after training camp. I had to have an awesome pair of Bass shoes for seventh grade – that I knew were too tight – but I wore them anyway. I jammed the foot sliding into second base playing softball for school. After all these, I had so much pain in my left foot – I looked like I had a bunion at 16 years old. I was embarrassed by my feet. I had to wear guy's tennis shoes so my foot wouldn't hurt. After my surgery, I had a straight and normal width foot – but I had a scar that Herman Munster would admire. I wouldn't wear sandals for a decade. I'm pretty used to the barometric pressure making my joints feel crappy by now. I can tell when the weather is changing just by how my foot, ankle, knee feel. But now it is my hip yelling "it is going to rain!". My hip is a recent pain I've felt more and more and I don't know why. It is the bad genes again (sorry, Dad), wearing flip flops, my chair(s) at work, the weather, sleeping with the windows open at night, my age and my weight. I can't do anything about some of these – but I am determined to work on the last. I'd bet the house if I went to an orthopedic surgeon today, they'd say "you know, it wouldn't hurt you to lose 40 lbs". That is what all doctors say to me, so that is an easy bet. So, I guess it is time to do so. Until then, I'm gimpy today because my hip hurts. If you know why I named this site, then you know how much I love the Packers. And if you love the Packers, then surely, Brett Favre is your king. In March, it was a sad time for Packer lovers – while at the same time an opportunity to rebuild. It was difficult to let Brett go. It was as if he died to me... because he did not exist anymore as #4. With all the Favre buzz lately, I've watched ESPN and Sportscenter a lot. I've secretly wanted Brett to just stay retired. No, I'm not crazy. I just wanted him to leave with dignity and on top. Because even though his last game was a loss and not a Superbowl trip, it was still a high. All the talk about him coming back, not coming back has been disturbing to me. Is he? Is he not? Packer fans and Favre fans had the hopes up and then down during the last month. I really wanted him to not play ever again. I didn't want him to play and fail or get hurt. That is not how a true star should leave the game. His continuous game streak should be left alone as-is. For the past couple of days, I was in denial, even though I saw Favre showed up in Green Bay. The rumors of him being traded seemed silly to me. If he wants to play – then the Packers should let him. Favre is the better QB – even if Aaron Rodgers has been groomed to take over. The speculations of Favre going to other teams like Minnesota and Tampa Bay were really upsetting to me. And yesterday New York's name was mentioned. All these seemed unreal that they'd ever happen – just rumors. So this morning at about 6:15 I hear the news about King Favre is now a NY Jet. I can't tell you how disappointed I am. I told my husband how I feel this morning. The death feeling in March was a time for mourning for Packer lovers. Now, it feels like a divorce. And your spouse is leaving you for someone younger, better looking and more money. This just pours salt in the wounds we've been trying to heal since March. I know I should be happy for Brett. After all – he just wants to play. It is evident that money is not what drives him. I wish him well, but it will be difficult to watch him in a uniform other than a Packers uniform. New York doesn't deserve a star like Brett. They've already rubbed it in our faces as they won the prize. 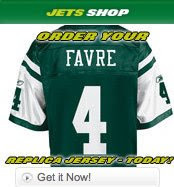 They even have an ad on their site to buy a Favre replica jersey today – #4 with green, but no gold. Today M and I had dinner with my folks along with great family friends. They're visiting from Wisconsin on their annual Ohio trip. I've mentioned this family before – actually one of the reasons why this site is macandCHEESEhead. see previous post "this is cheesey". Not only do we get to see good friends from "home", but they also bring goodies. Naturally, as a kid, this was really cool. But it is even better as an adult. You see, they bring cheese. OK, some people may be thinking, "what's the big deal?" If you think that – then you've never had good cheese. Really good cheese. We were just gifted with goodies galore. The good kind, too. So now we have over 12 kinds of cheese in our fridge. Yes, you read that correctly, 12. Normally, this is not a problem. In fact it is like Christmas Eve right after we open all of our gifts. But the bounty is in my fridge – not under a tree. Here's the catch: I'm weighing in with Weight Watchers on Friday at noon. Having Wisconsin Dairy State Cheese Company's cheese in my fridge is like having an open bar to an alcoholic. Like candy to a diabetic. Like steak on a Lenten Friday. Like crack to a druggie. Only my drug is cheese. Knowing this cheese is in my fridge will haunt me until I get home on Friday, AFTER my weigh in. That way, I'll have all week to hide my addiction until the next weigh in. If it shows up on my weigh in, I'm OK with it. This cheese is worth the points! ha ha - only today I have class - software class, that is. This post coming off a blah PC. I'll stick to Macs, thank you very much.